Isabelle Huault graduated from EM Lyon and holds a PhD in Management Sciences. 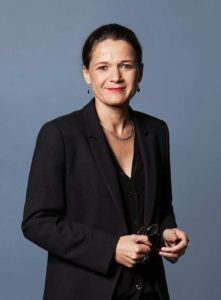 Isabelle Huault took office as President of Université Paris-Dauphine on December 9th 2016. She has been a Professor at Paris-Dauphine since 2005 and Vice-President since 2015. From 2009 to 2015, she was Head of the Research Center in Management (DRM UMR CNRS 7088). As a Professor, she taught strategy and organizational studies. Her research works mostly focused on the issues of the social construction of financial markets, financialization and financial regulation. – Society for the Advancement of Socio-Economics (SaSE). Isabelle Huault was bestowed Chevalier in the Ordre des Palmes académiques and Chevalier de la Légion d’Honneur.